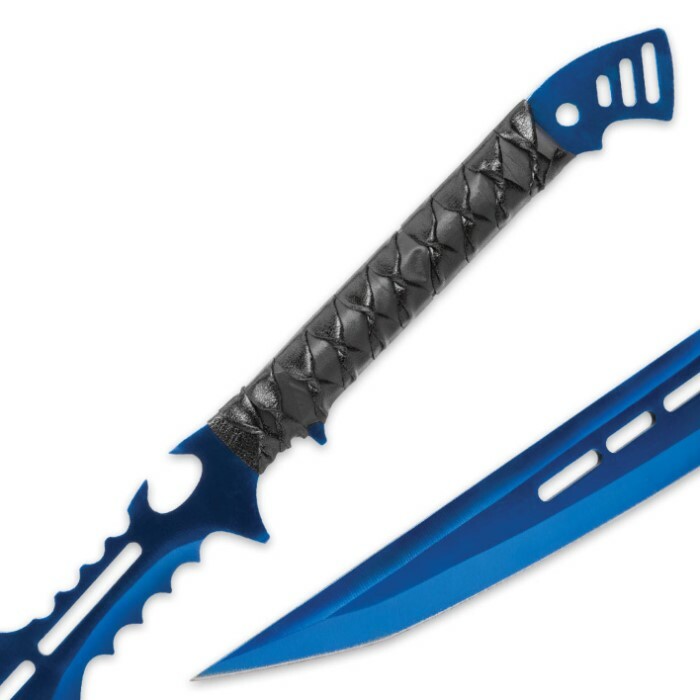 With its dark, menacing vibe and stunning iridescent blue finish, the Blue Guardian Fantasy Sword is a ferocious beast dressed in the elegant garb of a beauty. It's one solid piece of cold, unforgiving 3Cr13 stainless steel with electroplating that shimmers and gleams with radiant hues of azure and cobalt. 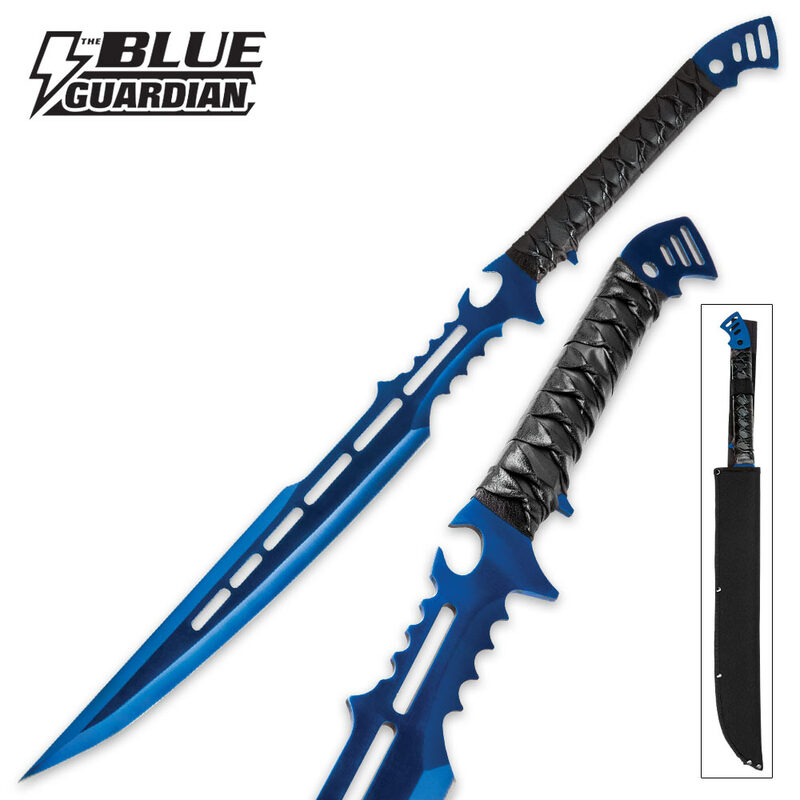 But don’t be fooled by the pretty face and “fantasy” moniker – the 28" Blue Guardian is a serious sword equipped with serious real-world weaponry. It boasts a carefully honed 18 1/2” blade with fierce, toothy serrations, chic elliptical cutouts and a stinging modified tanto point. Impeccable balance and a black faux leather-wrapped handle make the multifaceted Blue Guardian a pleasure to wield. It's also easy to store and carry safely, thanks to its tough black nylon belt sheath. 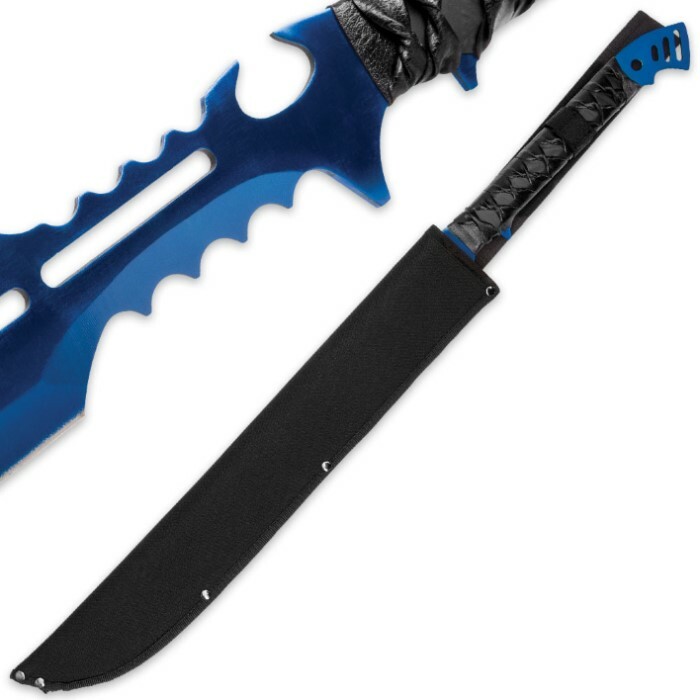 Fantasy sword or real-world weapon, beauty or beast - the Blue Guardian Fantasy Sword can be anything you want it to be. Got mine today it's ok what I expected for the price. It is not razor sharp as advertised disappointing to say the least. This is a cool sword and it has a amazing design. But the grip on the sword looks ehh. I think that they could have done better on it like doing a cord or something. But overal it is great. This is an awesome sword. Great blue color. Sharp blade. Had to redo the handle with some paracord and electrical tape. It cuts through water bottles and milk jugs beautifully. Get one while you can. Thanks BudK.